NEW and IMPROVED! - Our litter pick up tool has been improved! 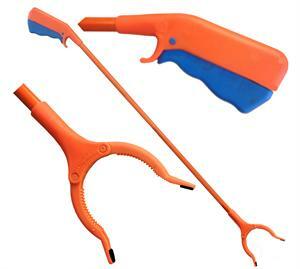 All orange in color with a blue contrasting squeeze trigger for easy visability if accidentally dropped. This trigger requires very little pressure and has a quick action. The jaws are serrated for better grasping. Also, the jaw head can be rotated 360 degrees to angle the reacher perfectly for those tight spots without twisting your wrist. 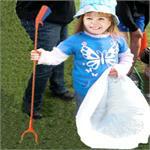 This lightweight grabber is made for volunteers - best for children and seniors. Not recommended for long-term use, heavy items, nor lending programs. 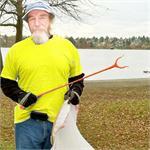 It does make quick and easy work of wrappers, cups, and other small pieces of litter. This is a great giveaway for volunteers at your next event. Pick up capacity less than 1 pound. 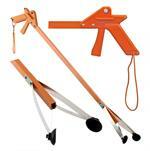 Bright safety orange aluminum shaft and handle litter pick up tool. Includes FREE personalized labeling for identification or recognition. Stainless steel fingers and elastic lanyard. 36 inches long.